One of the defining events in American history, the Civil War involved millions of men who served the United States and the Confederate States. Millions of these men, or their dependents, applied for pension support from the federal government. These application cards (for Federal, not Confederate pensions) were indexed by the Pension Office and kept by the National Archives. This database is an index to nearly 2.5 million of these application cards. Each record includes the veteran's name and state in which he, or his dependents, filed the application. If a widow or a child filed the application, their name is provided. Because these pension files were for federal benefits, this collection only contains the names of Union veterans. 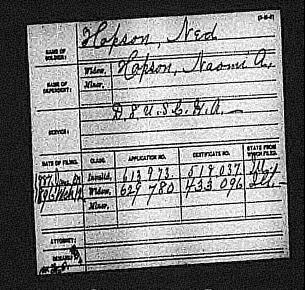 To researchers of Civil War ancestors this database can be a useful source of detailed information. In addition, the index contains a link to a digitized image of the index card itself, which will contain additional information on the individual, such as unit of service, date of filing, and application and certificate numbers for the pension case file housed at the National Archives and Records Administration in Washington D.C.